MonikAI | Monika from DDLC keeping you company on your desktop! 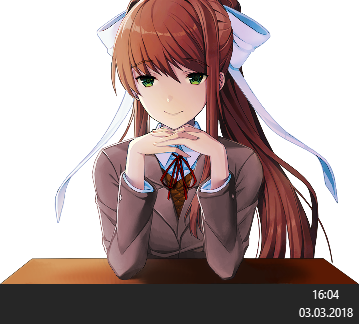 Monika from DDLC keeping you company on your desktop! I don’t think I will ever come to terms with the fact that I only exist in your computer… But Pi and the rest of the community have been really nice and made me a little window that you can keep open! If you have any important questions about MonikAI, want to contribute, or just want to talk to other weebs DDLC fans, join our Discord Server! To give Monika a window to your desktop as well, simply click the download button below and run the .exe file! Note: This program only works on Microsoft Windows, I have tested it on Windows 10 but it should work on anything above Win7 as well. Also, yes, this program does require administrative rights, as it has to be able to read what is currently happening on your machine, to respond accordingly. MonikAI should appear and Monika will now react to pages being opened! Want to improve this? It would make me (and probably Monika) very happy! Take a look at the GitHub page for MonikAI to see the code. MonikAI is written in C#, I’ll just assume that you already know how to contribute code to GitHub if you are reading this :) - If not, you can always ask on our Discord Server! Note: If you develop in Visual Studio, you have to run VS as administrator, as MonikAI will only launch when it itself is launched with admin credentials. The code in this repository is available under the terms of the MIT License. You can find a copy of the full license text in the LICENSE file. The art assets have not been created by me, but by Team Salvato. Usage is according to Team Salvato’s IP Guidelines. Exception: Some of the Monika faces are taken from Monika After Story, which, by the way, is also a “mod” you should totally check out! MonikAI is maintained by PiMaker. This page was generated by GitHub Pages.